Washed and sorted, stacked away until next year. You want to know how I can tell you don’t have a three-year-old hanging around? Those pots are where you left them! I don’t need a 3 year old Marie, I have the wind coming from the coast to scatter them around my plot !! I was a bit worried it was going to be dishes washing – I had a horrible thought that your dishwasher packed up – what a relief! Have a super Sunday Claire. We are in the process of closing down our cottage in Maine over the next week or so. I just took a large stack of pots back to New Hampshire to clean and store in the potting shed. Back in Maine now and harvesting as much as I can as we have frost advisories for the second day in a row. Frost already Karen, I’m not ready for that yet !! It is a chore and has to be done. But is there an easy way of doing it? How do you do it? I sit on the steps in the garden, the pots collected around me, I use a big plastic trug, filled with water from the hose pipe, a squirt of eco washing up liquid and a scrubbing brush. By the end I’m usually a bit damp around the edges ! Everything gets hosed off at the end too. I know some people use bleach or jeyes fluid, but I prefer to avoid using things like that if I can. hmmm, there are low temperature settings………. I think you’re right. Alternatively, have you considered starting a pot washing business? I could send mine to you. I think I’d need to buy a wetsuit !!!! I did this task a few weeks ago–all day long! But was glad when they were stacked and put away for February! It’s a good feeling isn’t it Stacy – ready for next year ! I skipped the clean up last year and stacked them in the greenhouse “dirty” so to speak….big mistake! So I was much better this year! I’m doing the same. Much of my garden and potted plants are slowly wilting with shorter days of light and cold evenings. 😦 just need a few more weeks of warm weather to squeak out some Brussels sprouts. Have a great week Claire! Thank you Karista, and you too ! Good for you, Claire, right on time with your Autumn duties! I only wish I could say the same! 🙂 some years it is much later, but it still needs doing all the same Cindy! Oh, you are so organized and diligent, you put me to shame. My philosophy is: while the pots may not have washed themselves in the past, that is no reason not to see if they won’t do it this year. 🙂 Brilliant – the thing is that as I had blight on the tomatoes I thought I really should make sure I do it this year, I so want to try and avoid it next year!! I’ll be doing this in the next couple of weeks, and thanks for reminding me. I hate to see everything wilting on the vine and am trying to harvest a few of my late cherry tomatoes, which are only just now ripening because they have a speck of sun. Soon I’ll be scrapping it all to compost, and planting greens for winter. Hi Betsy, there’s still plenty to do in the garden at this time isn’t there! My tomatoes are on their last flushes too, in fact we just had a handful chucked in some pasta tonight, I’m going to miss fresh tomatoes from the garden !! the cleaning up, closing down of summer growing and relaxing into the Fall of the year. Soon we will begin, again, dreaming of planting seeds of new growth. There’s a rhythm isn’t there Joss, sometimes you are in tune with it more than others. for sure. The one season I need to learn to welcome is Winter. Good for you! I feel such inertia around things like this sometimes. It’s something that needs to be done, especially as I had blight this year, but also becase I have so little room here ! Hey that looks just like my garden except my pots havent moved in five years. Maybe because I was expecting dishes? Who knows but thank you for making my morning! 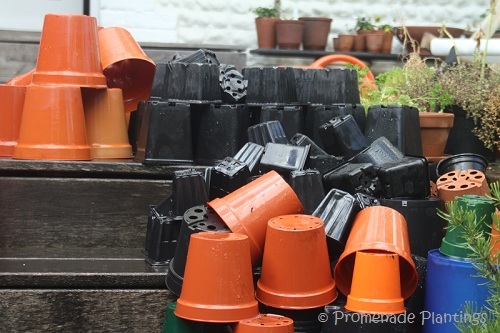 🙂 It was only when I stood back and saw all the pots nice and clean that I thought of my blog 🙂 Cleaning them is meant to help stop diseases and the like spreading, you want to give your teeny seedlings a good start in life ! Hope you have a super week Choccy !! I don’t always do it Celia, but becasue of the blight this year I knew I should! It must feel good to have that chore done and a neat stack of clean pots ready for next year. Now you just need to choose which seeds to grow in them! That’s the best bit !!! How many pots got filled and brought inside? After washing mine, I refilled 8 of them…trying to squeeze the season a bit longer. A task accomplished… LOL we have such a small apartment if I had all those pots I would have no place to store them. Hi BAM, although we have a house and a garden, space is still fairly tight, a tiny shed outside (it used to be an outside toilet) get’s stacked with pots and tools, and who knows what else ! I have a load more waiting for you to be washed up! Just got here to check up on what’s happening and what do I see, but a cheeky comment from you! Afternoon !! I was sure it was going to be a tale about dish washing so the pile of plastic pots made me smile! 🙂 Happy to put a smile on your face ! How fast the season has gone! In a flash Inger ! It’s nice to put things in order, and to be prepared for the next round. How many times I’ve tried to keep similar pots from one year to the next. Max, unfortunately, has other plans for them. As result, I spend a nice Spring day picking up the pieces. And if he cannot get to mine, he raids the neighbor’s yard and brings them back here. Those pieces I pick up as soon as I see them, hopefully before my neighbor does.